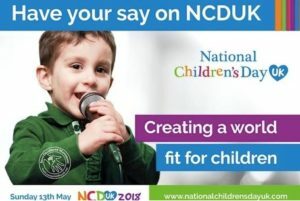 National Children’s Day UK provides a wonderful opportunity for people to highlight things that are going on in the lives of children and families and issues that they care about. The Save Childhood Movement, which established National Children’s Day UK in 2013, is encouraging people to run any kind of big or small event they want on the day itself or in the preceding week, to raise awareness about things they care about or projects they are running. From small family outings to whole school and community events, local authority initiatives, to share what they are up to online at https://www.nationalchildrensdayuk.com/get-involved1.html or using the hashtag #NCDUK2018. Children’s Day was first established in 1954 by the UN General Assembly to be a day of worldwide fraternity and understanding between children. While most other countries celebrate Children’s Day on the 20 November, the date nominated by the United Nations, in the UK it is celebrated at the beginning of summer.